Subject: "Prepare Word(tm) Documents for Posting" This topic is locked. Mesg #16 "Prepare Word(tm) Documents for Posting"
This might work with other programs as well, but Word is the one I am familiar with. Make a copy of your story and work with the copy. Some of this changes are not easily removed, and you won't want your original story marked up in this way. The first thing you will want to do is put in an extra return at the end of each paragraph. 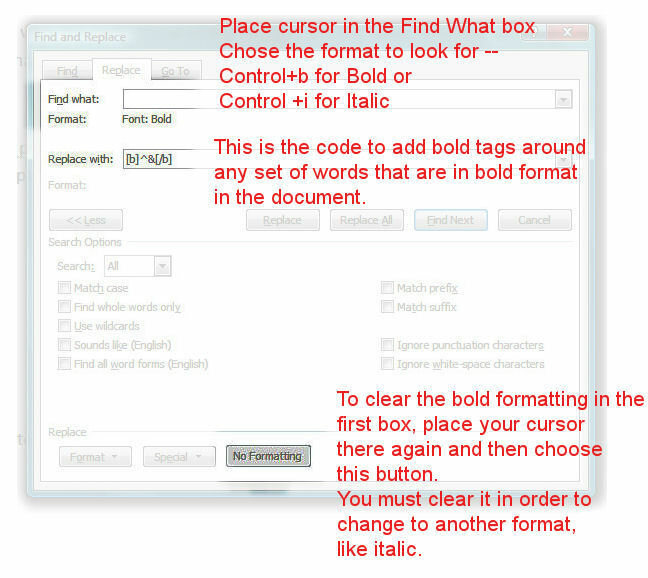 In order to do that you will need to use the find/replace tool in Word. You must use a lower case p. Tell it to replace all and you will have the extra line at the end of each paragraph. Now, in order to change the italic and bold into code you have to do something a little fancier, but not at all difficult. In the 'find' box, you need to set the format. You can do that by using the format drop down list, choose font, and then the format you want (like bold) or you can do it the easy way. Make certain the cursor is in the 'find' box. Press control+b (or whatever the Mac equivalent is). That will then show the format as bold. Do not type any words in the box. Hit 'replace all' and it will insert the code where it belongs. Please note that it will not remove the bold (or other) formatting, only place the proper code snippet around it. When you post, the words will now appear in the proper format. In order to clear the formatting in the 'find' box, place the cursor there and then hit the 'no formatting' button at the bottom (you will need to click on the 'more' button to show all this section). You will need to do this to change from one format to another, like from bold to italic. You should not use underlines in posted material. People will assume that it is a link and try to click on it, and then figure that it is broken. In a story snippet that's not so important, but it can be a problem in regular posts. In the case of stories, there is no reason to confuse the reader. If you have underlines, set the format in the first box for underline and then write the code in the 'replace' box for italic or bold.